Tsar Nicholas II and Tsarina Alexandra Feodorovna had five children. Four daughters, the Grand Duchesses Olga, Tatianna, Maria and Anastasia, followed by a son, Tsarevich Alexei Nicholaievich. The family were known to be very close to one another. Following the events of the Russian Revolution and Nicholas's abdication, the Romanov family were taken to Tobolsk, where they were imprisoned. Numerous rescue attempts have been rumoured, but if any were attempted they didn't succeed. In 1918 they were transferred to Yekaterinburg and imprisoned in the Ipatiev House, otherwise known as the 'house of special purpose'. On 17 July 1918, the Romanov family and a number of servants were led into the basement, unawares that a firing squad was being assembled. The Romanovs were executed in a hail of gunfire. The Grand Duchesses survived the initial round of bullets due to the jewels they'd sewn in their gowns. They were then stabbed with bayonets and shot in the head at close range. For some time after their deaths there remained rumours that one of the Romanov children may have survived, however in April 2008 DNA tests concluded that the remains of all family members had been found. The murdered Romanov family have since been canonised by the Russian Orthodox Church into sainthood. 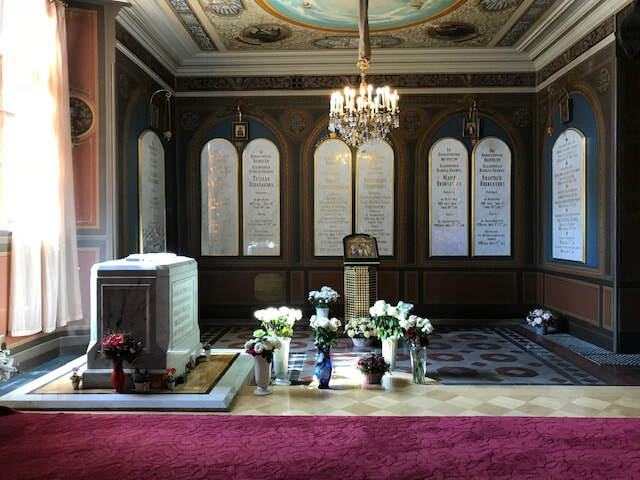 Below image: the final resting place of the Romanov family, 2018. Picture belongs to Kerri Turner.